Milwaukee Public School System partners with Atlas Roofing Corporation and local contractors to design innovative drainage system, extending roof lives to 30+ years. 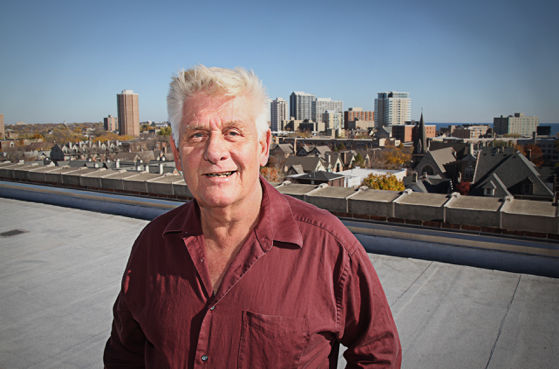 When Dennis Fula took over responsibility of the Milwaukee Public School System’s (MPS) roof maintenance over twenty years ago, many of the schools were under threat of closure due to unsafe conditions. Determined to ensure the city’s students had safe roofs over their heads, Dennis partnered with Atlas Roofing Corporation to ensure that the MPS roofing systems would solve safety concerns and extend the life of the historic school buildings. Located throughout the city of Milwaukee and neighboring towns, MPS houses thousands of students, and after years of wear and tear, the buildings’ roofs were in terrible shape, with some in threat of condemnation. According to Fula, there were sometimes over 100 leaks on a single roof. Before Fula took the reins, the school system simply added new material on top of the previously damaged roof. That type of short-term fix created a myriad of issues, including pooling of water and problems with drainage. It also made the roofs very heavy. Fula needed to lighten the loads, improve thermal performance and implement a positive drainage solution. He wanted to develop a roof system where maintenance would be more like “giving it an oil change,” instead of buying a whole new car every time. Dennis realized the school system needed a long-term solution to their roofing problems. Because a preventative investment can be more costly up front, it took more than five years to secure agreement among key decision makers. Dennis was able to guide the team on the extensive long-term benefits of a more holistic and comprehensive roofing system, including the implementation of the Atlas Roofing Corporation Certified Drainage Program (CDP™). Dennis connected with the team at Atlas Roofing Corporation, who was involved from the very first evaluation steps. Dennis and the Atlas team put together a 20-year program that would extend the life of every roof. With more than 200 school buildings in the system, the roof maintenance program needed to be efficient and effective. For safe and systematic roof maintenance, the MPS and Atlas team designed a thorough, specific inspection process for each roof. The team would begin by conducting a visual inspection, where each roof is checked for obvious cracks, holes or punctures. From there, the team would evaluate for moisture using infrared technology, and conduct test cuts to further examine any potential damage under the surface. They would then be able to cut out any moisture damage found and replace as necessary. With the maintenance program and repair process in place, the team determined these inspections should be performed on each roof every five years. However, with hundreds of roofs and only three full-time MPS roofers and a limited budget, these inspections were destined to get backlogged. Fula had to find a way to ensure the safety of the students and faculty by continuing to perform adequate maintenance checks and repairs on the entire 10 million square feet of roof, while cutting down on labor and material costs. The team understood that they would need to implement a long-lasting roofing system that could safely extend the time needed between routine evaluations. To accomplish this, they set out to design and install a roofing solution that would prevent rainwater ponding, was lightweight, had low heat transfer and was built to last. Utilizing a roofing system that creates positive drainage would ensure the rainwater would not pool on the roof, reducing damage and the number of new leaks. Dan Dalle Nogare and the team of specialists at Atlanta-based Atlas Roofing Corporation went to Milwaukee to assist the team in solving their roofing issues. Dalle Nogare joined the MPS team on the roof of the buildings to inspect and work through the issues firsthand, which according to Fula is unprecedented in the industry. Through a hands-on approach, Fula and the Atlas team worked together to create a system featuring a tapered polyiso insulation system. That system is known as the Atlas Roofing Corporation’s Certified Drainage Program. CDP is a comprehensive low slope tapered design service led by Dalle Nogare and his team of Atlas CDP Design Professionals, to eliminate ponding water on a roof’s surface. The program’s designs help to prevent structural roof collapse, moisture invasion, membrane degradation, loss of thermal resistance, ice formation, vegetation growth and voiding system warranty. While some manufacturers will give a 25-year warranty, CDP ensures positive slope and drainage, which helps extend the life of the roof beyond a typical warranty. With proper maintenance and care, the MPS roofing system can last for 40 years. Dalle Nogare works on-site with the building owner, architectural or engineering design professional and certified CDP roofing contractor to develop the best solution for each unique case. Certified Drainage is crucial to extending the life of a roofing system, as ponding water is the number one reason roof systems prematurely fail. The first step in the CDP process is for Dalle Nogare and the Atlas team to conduct a full auto-level survey to measure for irregularities in slope causing drainage issues. In order for a roof to drain properly, Atlas requires a positive slope of about 1/8”. Once the survey is complete, Dalle Nogare and his team of roofing specialists create a grid based on the auto-level transit. The accuracy of the survey team in these initial steps is crucial, as they serve as the basis for each individual roof design drawn by Atlas product specialists. 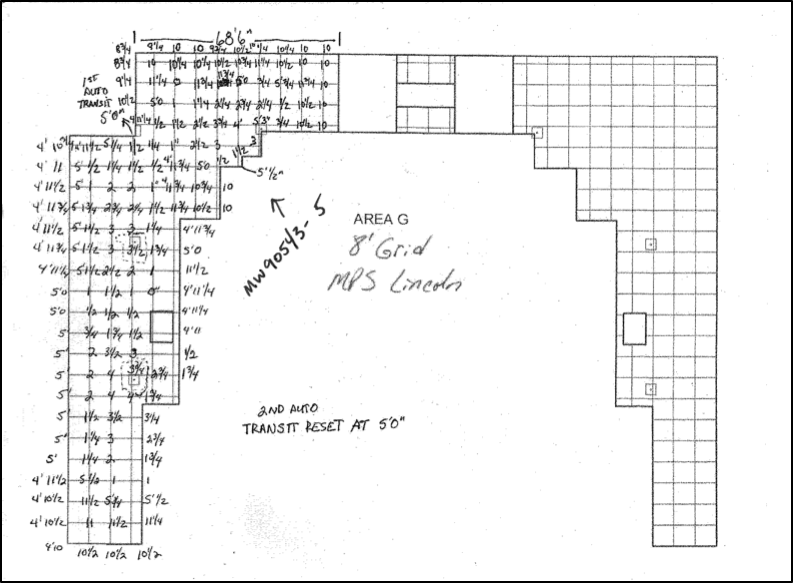 One of the grids drawn for MPS by the Atlas CDP team. This process is done for every section of every roof. The presence of Dalle Nogare and other account reps on-site throughout the process has proven invaluable to Atlas and its customers. They serve as the eyes and ears of the organization, and ensure project success from start to finish. For example, once the new roof is installed and has experienced the first significant rain, it is the rep who gets back up on the roof to conduct a rain test to ensure the new installation is working properly. By utilizing the Atlas Roofing Corporation’s Certified Drainage Program, Dennis and the Milwaukee Public School System team were able to save on time and labor in addition to extending the life of each roof by at least 10–15 years, and in some cases more than 20. In fact, before implementing the CDP system, each school was only getting 20, 15 or as few as 10 years out of a roofing surface. Now the MPS team expects their roofs to last at least 30 years. According to Dennis, since implementing this system over 20 years ago, the team has still yet to replace a roof with the new the CDP system installed. Dennis’s son, Ryan Fula, has taken over for his father and is now the crew leader of the MPS roofing shop, leading the charge on all MPS maintenance programs. Twenty years after Dennis and his team implemented the Certified Drainage Program, Ryan, along with MPS Manager of Design and Construction John Linn, see the real value it provides. Roofs that normally would need to be replaced within the next few years are now able to withstand an additional 10–15 years of Wisconsin weather. 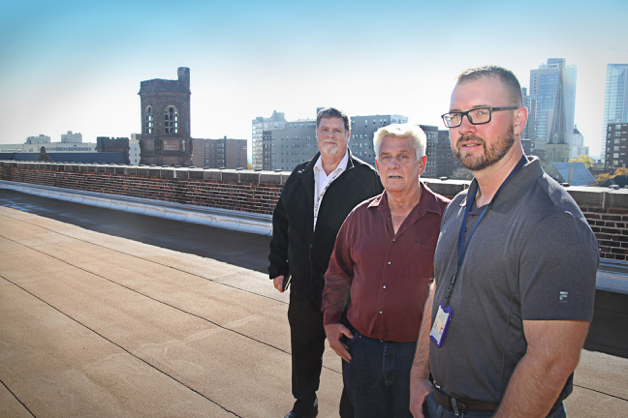 The proud team at Milwaukee Public School System, on one of the 200 historic roofs. From left to right: John Linn, Dennis Fula and Ryan Fula. While maintenance is still required, the number of repairs needed is reduced each year. Before utilizing the CDP, Dennis would find 200–400 leaks to inspect after rain and now, Ryan and his team are dealing with an average of only 20–30 leaks per building, of which only a fraction are leaks caused by the roof.